As this past Saturday nights “The Moment” boxing show SLOWLY fades into history, I couldn’t help but notice how ironic the outcomes turned out to be. Redemption for a couple of main event fighters, upward mobility and the highest accolades for another. For the main guy, even though he won the fight (I scored it 115-113 for Mayweather), a lot of questions are being asked. Has Mayweather’s defensive code been broken, is father time finally catching up with the P4P Picasso, will Mayweather RETIRE or give Marcos Maidana the rightful rematch he deserves? Will Mayweather even complete the final 3-fights on his Showtime deal? As a long time Mayweather fan and a follower of boxing for 50+ years I’ve seen all my boxing favorites get to a day where they are no longer the fighters they once were. Father Time like the Grim Reaper has a way of showing up when you least expect him. The same happened not too long ago in 2003 to another favorite of mine Roy Jones Jr. After moving up to heavyweight and clearly defeating then champion John Ruiz in a spectacular display of skills, Jones returned to his home – the 175lb division, to regain the 175lb title against little known Antonio Tarver who’d been a rival of Jones when they were both amateur fighters. I’d heard that Jones had dominated Tarver in the amateurs and the expectation was that Jones would do the same in the professional game. Tarver flipped the script on Jones and gave the ‘heavyweight’ champion ALL he could handle with Jones squeaking out a ‘razor thin’ victory over his amateur nemesis in a fight that MANY saw Tarver winning. After that fight the pressure was on the P4P King to rematch Tarver and set things right, and as they say the rest is history. Jones could’ve remained at heavyweight there was a $10M offer on the table for him to face South African heavyweight Cory Sanders (RIP) with Mike Tyson and Lennox Lewis to follow. Parallel Mayweather’s activities of 2013-2014, with, Jones’ activities of 2003, substitute Canelo Alvarez for John Ruiz and Marcos Maidana for Antonio Tarver and it is easy to see that a similar situation exists for the 2014 P4P King. The ‘catcalls’ are loud and clear that a rematch for the Argentinian is deserved and rightfully expected, and that Floyd Mayweather needs to set things right. Coming off of his great win against Canelo Alvarez, Mayweather has repeated the pattern of Jones by dropping down in weight and facing a guy that everyone thought he would easily beat, but instead struggled to pull out a ‘razor thin’ victory, the same as Jones 11 years earlier. 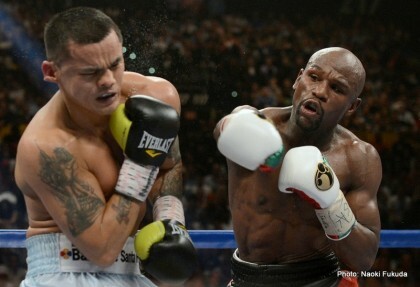 Now all that has to happen is for Maidana to set things right in the rematch, and history will be repeated. Next boxing news: Martin Parlagi – A new star on the internal scene?